Part 1 covers: Planning your trip. How to find the best deal on your cruise, flights, and hotels, how to book your cruise, what to pack and bring, and other trips for BEFORE YOU GO. Part 2 covers: All about cruising! 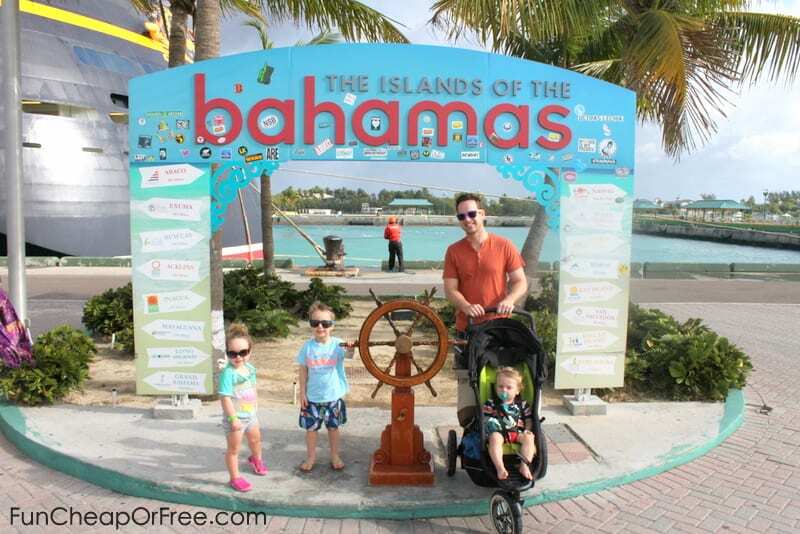 What to expect, things to do on and off the ship, how to manage cruising with kids, and a full rundown of our cruise and what it was like for us, and other trips about CRUISING WITH KIDS. 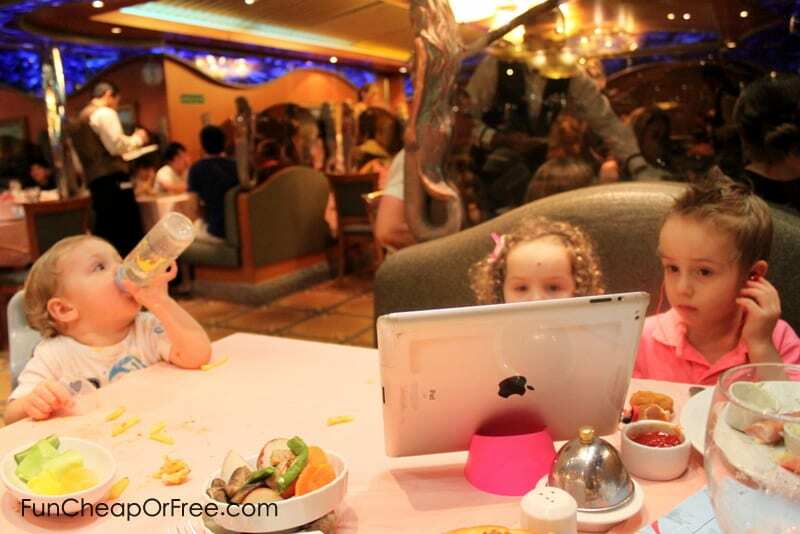 Why did we decide to take our kids on a cruise? Weren't we scared of cruise horror stories? On the 2nd week of February, we were calendaring out our year and saw that my kids had some Southwest flight credits that we needed to use by June. (more about the flight credits below.) June is peak season to travel, we are already traveling in May for my high school reunion, I have a conference in April to attend, so we decided to shoot for February or March. I knew from research that cruises get cheaper the more last-minute they are typically, and flights looked pretty reasonable so we decided to roll with that. 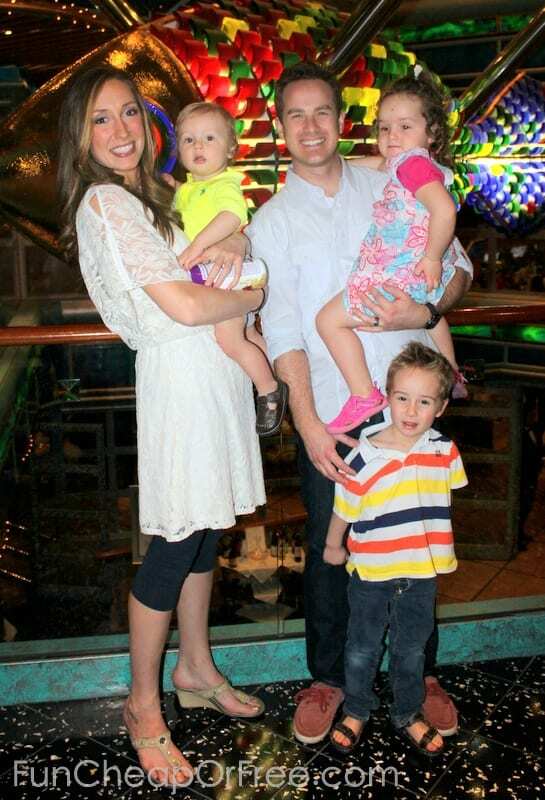 I, personally, love cruising so it's usually my top choice for travel – with OR without kids. Your food, entertainment, places to go/things to see…it's all done for you. You wake up in a new country or island, without having to worry about currency changes, figuring your way around a foreign country, or the fuss of transportation to and from the places you want to go. You could stay on the ship 100% of the time and still have a blast! Since our kids are so young (4, 2.5, and 1)we figured it would be an affordable way to do an “exotic” vacation, and just about as simple as we could get. We went on a cruise with my family when my son was 15 months old and I was pregnant with my daughter, so I had a pretty realistic idea of what it would be like/what to expect. Why not a Disney cruise? Came down to one thing…cost. We would have preferred Disney, it's definitely the most family-friendly way to go! But we needed to go before June, and we couldn't find one that fit within our budget. They are very expensive, because they are some of the nicest cruises you can go on – kids or no kids! We definitely want to take our kids on a Disney cruise someday. Plus, since it was our first time cruising with kids we didn't want to risk ruining a Disney cruise if it turned out to be an epic disaster so we started with Carnival as a “tester”. Since Carnival went great, Disney will definitely happen someday! Why a cruise? Weren't we scared of all the horror stories you hear on the news? Good question. My answer? NO. Not scared a bit. Power outages, flu outbreak, weird freak incidences…look. Here's my take on the whole thing. You could get in a plane crash on the way there. You could have your breaks go out in your car. Your house could be struck like lightening. A horrific flu outbreak could sweep your child's entire school. There is no avoiding this stuff! Freak things happen! COULD they happen. Sure. Are the odds in your favor that they WILL happen? Absolutely not. Want to know why your doctor tells you not to google symptoms online? Because only the horror stories make news. So don't necessarily judge a cruise line by bad press. Judge a cruise line by it's customer reviews! It's inevitable that anything can happen to any ship at any time. That's just the way it goes! THIS article lists some of the funky things that has happened to cruises in 2013. Guess what cruise line they listed as the worst in 2013? Wait for it. DISNEY. We read THIS ARTICLE before going that made us feel confident about our decision to cruise. It basically said that sickness outbreaks effect 1 in every 200 ships. So whether you contract the flu from your flight to see Great Aunt Bernie, or your house gets sucked into a sinkhole, there are some things in life that you just can't help. The odds are they WON'T happen to you though…so why live your life in fear of them and avoid fun adventures along the way? Now that you know the background, here's how we pulled it off! 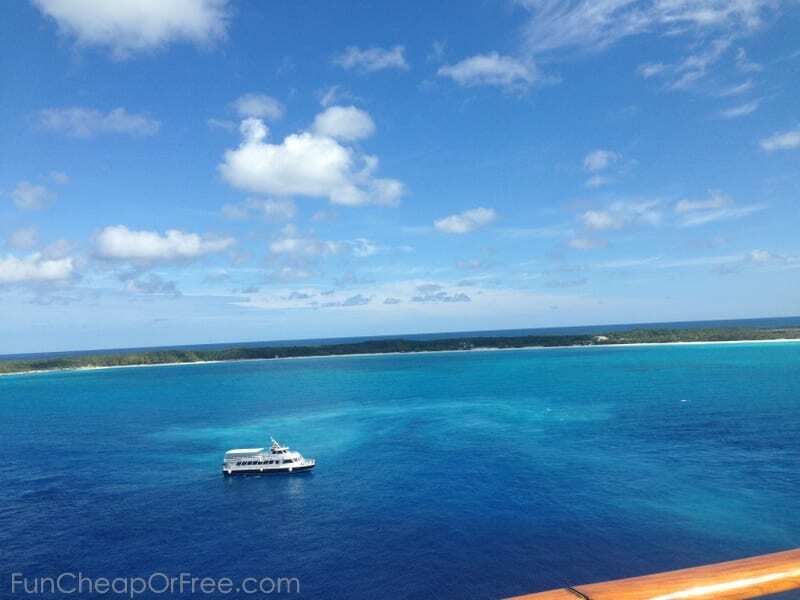 View of Half Moon Cay water (day 4) from the ship deck, no filter on the photo. 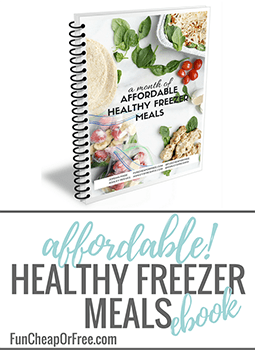 SET A BUDGET AND SAVE UP FIRST. Set a budget for your trip, save up the money BEFORE booking it, and stick within the budget! If you didn't save up enough to go on the exotic vacation you were hoping for, opt for a less expensive vacation, or wait until you save up the money you need. Booking your cruise far in advance is a way to get a great price, so taking your time can pay off for sure! Make it fit.. Lots of people ask, “how much would a vacation to blah blah blah cost?” and pay whatever amount it takes to get there. I recommend doing the opposite. 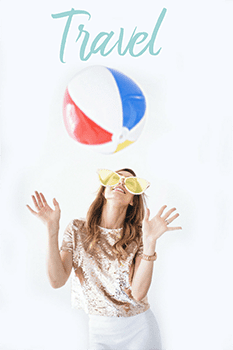 Set a budget, then find the best possible vacation you can that can fit WITHIN that budget…not the other way around. After having my 3rd baby in Feb 2012, I was ITCHING for a vacation with just my hubby. We would argue about it. I would say “I want to go to Hawaii.” My husband would say, “that would cost $6K, we can't and shouldn't afford that right now.” We would go in circles, never getting anywhere. Finally we wised up. 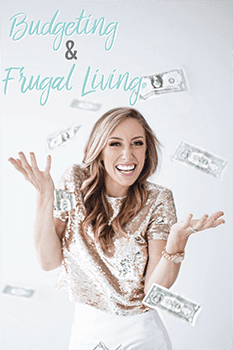 We had a little money in savings that we didn't have a plan for, and found places to cut back in our monthly budget. We finally decided to set a budget of $3,000. We agreed that once we saved up the money, we would use it for a vacation, and we would try to get the best vacation possible for that money. You must give up something, to gain something. Let's be honest, $3,000 is A LOT of money (especially to us!). You can do a lot with $3K! Seeing the dollar figure up-front was a good way for us to really think, re-think, then think again about our trip, considering all the things we would be giving up to spend that much on a week-long vacation. Because, yes, any dollar you spend on one thing is taking a dollar away from spending it on something else. Be mindful of your dollars and make sure it's going to the most important things first. Just for the record, we ended up spending closer to 4K on the trip. The $3K was originally set for a tropical vacation for just Bubba and I. Once 3 kids were in the picture the budget went up to $4k, which was right about what we ended up spending. News flash: vacations are expensive. Just FYI…$3k for a trip is not only realistic, but that's actually on the LOW end of what to expect, sadly. If you stop and truly do your research and add up all the fees, food, travel, activities, etc. $3k is a drop in the bucket many times for an exotic trip that you need to fly to. We cut back a little each month. We saved all extra money (tax return, some blog money (see how my blog makes money HERE), credit card cash rewards, etc) for about one year in our family savings account and had saved up over $4,000 over time. Once the money was saved up, we took our time and didn't book our trip right away. Remember my 3 Month Rule? Don't let our money burn a hole in your pocket! We took our time and made sure to look at lots of options. When the flight credit expiration came up on our calendar, it was the push we needed to finally book our trip and put it into action. The cost of cruises vary for lots of reasons including cruise line, length of cruise, where you port from, where you travel to, time of year, and travel trends. Be warned…cruises can be VERY affordable last-minute. Don't even start looking until you have a budget set, and money saved up so you're not tempted to buy something you can't (or shouldn't) afford! (see below). They are also very affordable when booking REALLY far in advance so that's also a route I recommend! Legally, websites can't offer deals on cruises. The cruise lines set the cruise price, and it is what it is. The price will change, sure – but the prices will be the same across the board. Third-party websites can offer upgrades and on-board incentives (like “ship” money), and can make a price look better by leaving out fees and taxes when advertising the price, but whether you call the cruise line directly to book, or book using a 3rd party website, the price will end up the same in your shopping cart once all fees and taxes are factored in. I tested this 2x and found it to be the case, as well as calling the cruise line directly and asking them how it works. I used VacationsToGo.com, and loved it. Again, the prices will be the same as shown on the cruise line's own website. I just like their website because they show EVERY cruise line, going EVERYWHERE, has great search features, and has it listed in a spreadsheet style, which makes for easy comparing. It's ugly as sin but it's functional, which is what matters most. The guy I worked with was named Drew, he was great. I hope he doesn't mind, his number is 1-800-338-4962 ext. 7881. Yes, you have to pay for your babies. Your baby must be 6 months old to cruise, and from 6 months old you pay for them to cruise. It's not as much as an adult ticket if you all fit in one cabin (see below), but it still costs. Booking the cruise was actually very easy! I was so surprised! I was on the phone for only 5-10 minutes and gave basic info – names, birthdays, and genders, credit card info. He was like, “ok! I'll email you your cruise info and have a great trip!” I was surprised, I thought they would want my fingerprints, retina scan, and a urine sample or something. 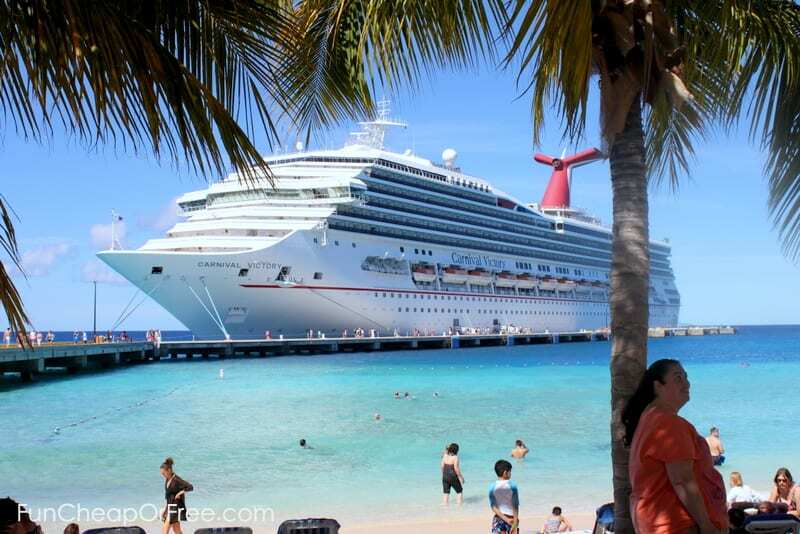 The cruise we chose was a 5 night Bahamas cruise from Carnival, on the Carnival Victory. We had never cruised with Carnival, but the price was right and the cruise looked awesome so we went with it. Overall we were very very pleased, just for the record. We chose this particular cruise because the price was because it was a newer ship (built in the 2000's, updated recently), and only had ONE DAY AT SEA. This is HIGHLY recommended if traveling with kids! Those days at sea can be boring, especially if the weather isn't great like on our sea-day. The cruise price was $309 when we first saw it, then dropped to $279 a few days later when we called back to finalize and book the cruise. However, that was for a small interior cabin. In order for all 5 of us to fit (including a crib for Beck) we paid $40 for the week to upgrade to an ocean view room. It gave us more square footage, which makes a BIG difference in those small rooms. Worth every penny. See Part 2 for info and pictures about our cabin and accommodations. Random tip: Tell your booking agent if you are prone to seasickness. They can put you on particular parts of the ship that will help you not feel the rough water as much. We were on the first floor, low in the water, so we could barely even tell the ship was moving. However, we talked to a couple who was on the 8th floor and had it so rough, they had to duct tape their closets doors shut because they were banging around. Drinks. Juice, milk, hot chocolate, basic coffee, and water (not bottled water though) are free on-board. Soda, alcohol, and specialty non-alcoholic drinks all cost extra. You can buy an unlimited soda card. On my cruise it was $36 for unlimited soda for the 6 days. SAVINGS TIP: The first day of your cruise, you board the ship in the evening and basically just eat Dinner on-board. Instead of buying the soda card on day 1, I actually waited until day 2 to buy the card (the last day the special was being offered), so I could get 5 full days out of it. The prorated cost was $26. Thinking back, we probably didn't need the soda card in the first place, it was an unnecessary expense. But I enjoyed it and was able to share some of my drinks with Bubba, so at least it saved me $10 by waiting one day. ANOTHER SAVINGS TIP: Bring your own cases of bottled water and sodas! You can do that! Tons of people did on our ship, I wish I had known earlier. Swing by the gas station or a convenience store before boarding and grab some. It sure beats $36 or $26 for a soda card. Gambling and Bingo. There's a casino on-board and Bingo nights. You must buy-in to play. Photos, gifts, and shops. There are shops on-board the ship where you can buy anything from clothes, to bottles of alcohol, to basic travel needs (sunscreen, seasick meds, etc. ), to expensive art and sculptures. There are also photo backdrops and photographers throughout the ship that will take your photo and you can buy it. Those all cost extra. Excursions. If you want to do fun adventures off the boat you need to pay for them, and you can book those through the cruise ship or wait until you are in port like we did (details in Part 2). Gratuities. You don't tip any staff on-board, they have you pay it in one lump sum at the end of your cruise and they divide it out to all the staff. It's roughly $11 per person, per day – except for our baby. Not sure what the age cutoff is, it was a pleasant surprise that they didn't charge for Beck (who is one). SAVINGS TIP: Our booking agent told us that once on the ship, to go to the service desk on-board and tell them the ages of our kids. Because they are so young, they dropped the gratuities for our other 2 kids, saving us over $130! Drive, or fly? We normally choose places we can drive to and typically choose NOT to fly places, to save money and have a car to drive once at our destination. But with the flight credit and the trip money we had saved up, we decided it was time to splurge and do a fun tropical vacation as a family for the first time – which required flying. Find your port city first. Each cruise ports from a different city, and this makes a big difference when it comes to flights. For us, doing Mexican Riviera cruises that leave out of California are more affordable because we could drive there (we live in Utah). However, from my own research and interviewing other people, cruise lines tend to send their older ships out of California ports. I have done 3 cruises, two from Long Beach, CA and one from New Orleans. All 3 times the ships weren't nearly as nice as the one we went on for Carnival that ported from Miami. Not sure if that's always the case, but that was my personal discovery. So for us, we decided to pay more and fly out of the East Coast to try a new cruise, destination, and port city to get a different cruising experience. Look at flights BEFORE booking the cruise. We looked at flights to make sure they weren't astronomical, since we had only 18 days before the cruise we wanted to go on. The flights ended up being very reasonable on Southwest, even last-minute! Flying from Salt Lake City to Ft Lauderdale cost us about $380 per person (except the baby, who is a lap child and flew free). 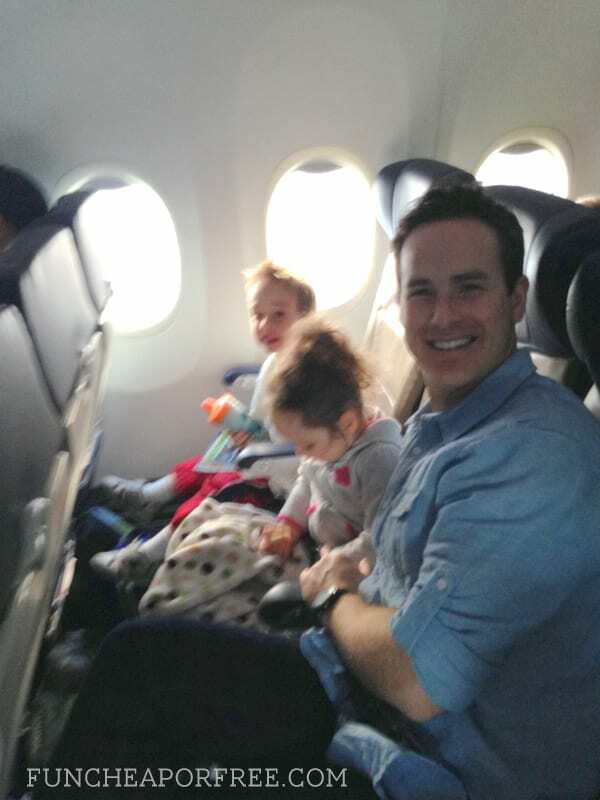 Bubba had a $100 Southwest gift card (Christmas gift from family) and the kids had their $200 flight credits that helped too. Find the best flight deals. Check out all my tips for finding cheaper flights. Remember to always book your flights separately per person – you will mostly likely pay more if you book them all together! Lame, but true. Use flight points. If we hadn't used our frequent flier points to buy a flight for a family reunion already, we would've applied them toward this trip. Use what you have, every dollar saved really helps! Use credit card cash rewards. Another way to help cover your flights is to use your credit card points and cash earned. I have the Costco Amex (as explained HERE) so I saved my cash rewards from February and applied them toward our trip. It was a couple hundred dollars extra that really helped! Keep your eyes peeled. Be aware…while cruises are often cheap last-minute, flights tend to get MORE expensive last-minute. So don't wait too long to book your flights. As mentioned in this post, I use AirfareWatchdog to help me keep my eye on flights, especially to exotic destinations. When a good flight pops up, jump on it (…making sure you've saved up, set a budget, and know where you want to cruise to, that is). Consider small fees when booking flights. We like to use Southwest to fly for a few reasons. For one, two bags fly free per person. Two, you can cancel or change flights at any time without a fee. So, if we buy flights and one week later I see the same flights for cheaper, I can “buy” the new, cheaper flight, and it will refund me the difference in the form of Southwest credit, good for one year. Same thing if you cancel a flight, it saves what you paid as credit. So if a good deal pops up, we will buy it without thinking. If we need to cancel or change our flight, we know we can use the credits on a later date without being penalized. Allows us flexibility and peace of mind. TRAVEL NOTE: flight credits on Southwest can't be transferred to someone else's name. So if I have $50 Southwest credit, Bubba can't use it toward his flight – the credit is under my name so I have to use it. We had about $200 credit under the kids' names, so we applied that toward our flights which helped. Check and double-check all transportation details. Southwest only flies to Ft. Lauderdale, and our cruise left from Miami. While there are cruises that leave from Ft. Lauderdale, they were far more expensive, and had more days at sea (boo!). We did some research and found out the cities are only about 30 miles away from each other, did more research to see what a shuttle or taxi would cost (see part 3 for all those details), and decided it was worth the cost of a shuttle to get the cruise we wanted. Consider flight times and your cruise itinerary. As shown on the cruise itinerary above, our ship was leaving at 4pm on day 1. Since we are in Utah and our ship leaves from Miami, there was no way we could fly across country to Ft. Lauderdale, shuttle to Miami, and make it in to our ship time, so we were forced to fly in 1 day early. However, don't look at price alone. We wanted one that offered a free shuttle from the airport. Even if you pay $20 more for the hotel room, it might just be cheaper than paying a taxi so be sure to do your research. Consider hotel location. We wanted a hotel that was near the airport since we were arriving late on that first day of our trip. We didn't want to have to drive the 30 miles to Miami until the next day, so we could get to bed at a reasonable hour. So that played into our decision as well. We ended up staying at the Econo Lodge in Hollywood, FL. It was…well…pretty dumpy. We affectionately refer to it as the roach motel. It served our purposes just fine, but it was NOT a nice motel by a log shot. At $127 a night (including tax) it was the cheapest we could find by far, so we went with it. It included a continental breakfast which was helpful. Check out part 3 for how we made it manageable with kids. Note to anyone reading this…do EVERYTHING YOU CAN to travel home same-day you exit your cruise ship!! If you want to extend your trip, extend your trip BEFORE your cruise. Why? At the end of the cruise you're tired, you're fat (literally), you're hot and sunburned, you're ready for your own bed, and ready to get home. That last day we were cranky and tired and were ready to get back to Utah. So keep that in mind! That being said, the hotel we stayed at in Miami after our cruise before flying home was the River Park Hotel & Suites in Miami. It was pretty nice! We were shocked that it was the best priced-hotel we could find at $143 per night (including taxes), because it was way nicer than the roach motel we stayed at in Ft. Lauderdale. It was in the heart of down-town too which was fun. He used Travelocity to find the deal on that hotel. Again, see part 3 for how we made it manageable with kids. We reserved a rental car for the day we got off our cruise ship, thinking we would need a car to site-see around Miami, get us to the hotel, etc. We ended up canceling it and just used a taxi because it was much cheaper. We used the hotel's free shuttle to get from the Ft. Lauderdale airport to the Hollywood, FL hotel. We used a shuttle van to get from the hotel to the Miami port the next day. It cost us about $80. We opted for a shuttle van because we didn't have car seats for our kids and figured we wouldn't be able to let them drive in a small taxi. Plus, with our suit cases and double-stroller we took up more space than a small trunk would allow. We used a taxi from the Miami port to our Miami hotel, then a taxi from our hotel to the airport the next day. It was, again, around $80. Expensive, but cheaper than renting a car. SAVINGS TIP: Did you know you can pay taxi and shuttle drivers with credit cards much of the time? It's true! We paid for our shuttle with a Visa card. NOTE: If your driver is parked too close to the ship, his CC reader won't work. Our driver had to drive a block away, because the ships block the service or something. Anyway, we loved using our card because we get cash-back from our credit cards, and it helps us keep track of how much we spent on our trip. Plus, withdrawing cash from an ATM is expensive, so it preserves your precious cash and saves it for situations where CC's aren't allowed. 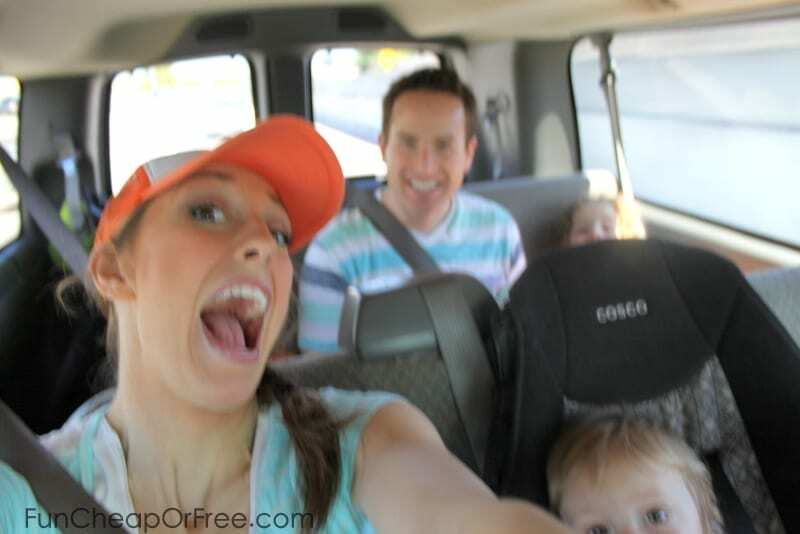 What would a shuttle van ride be without a blurry car-selfie?? PACKING TIP: No need to pack your own car seats. Just call ahead and borrow some! We did, and our shuttle driver provided a car seat for our little guy. This is every bag we packed on our trip for the 5 of us. We tried to travel light, but still allow for room to bring home inevitable souvenirs and random odds and ends. The ship cabins are small and don't allow for much room for suitcases, so keep that in mind! The pink floral bag was my carry-on bag that had snacks, bottles, baby food, diapers, toys, and spare clothes for the kids for the flights. The black duffel held diapers and wipes, and spare snacks. Bubba's backpack (not pictured) which he used as his personal bag, and carried all our electronics in it. Our two big kids had to carry their own backpacks that were full of toys, snacks, and their blankets to sleep on the plane. If you are pregnant, you'll need to check with your cruise line to see how many weeks duration in your pregnancy they allow before they say you can't cruise with them. For many it's 26 weeks pregnant or less. You will need a doctors note proving how many weeks you are, so arrange that ahead of time. Make sure you have your birth certificates and passports in order. You don't need a passport as long as your departure and arrival ports are in the US. Bubba's passport is expired, so he had to have his original birth certificate and driver's license. I used my passport. For your kids, you need original birth certificates – not copies, and not hospital certificates. They must be state-issued. Boy, did I have a scare with this one. Two days before our trip I sat up in bed in the middle of the night and the thought came to me that I forgot to order Priya's certificate when she was a baby. She's 2.5 now! How have I never noticed until NOW! I ran to our filing cabinet and low and behold, no certificate. I was frantic. Luckily she's old enough that I was able to walk into our local health records office, pay $18, and 10 minutes later walk out with a certificate. But I lost a lot of sleep over that dilemma that night. DON'T PUSH IT. Make sure you order your proper documentation LONG before your trip. Make photo copies of all your ID's and laminate it, or put it in ziplock baggies. In case something happens to the originals on your trip, at least you have copies which might help. 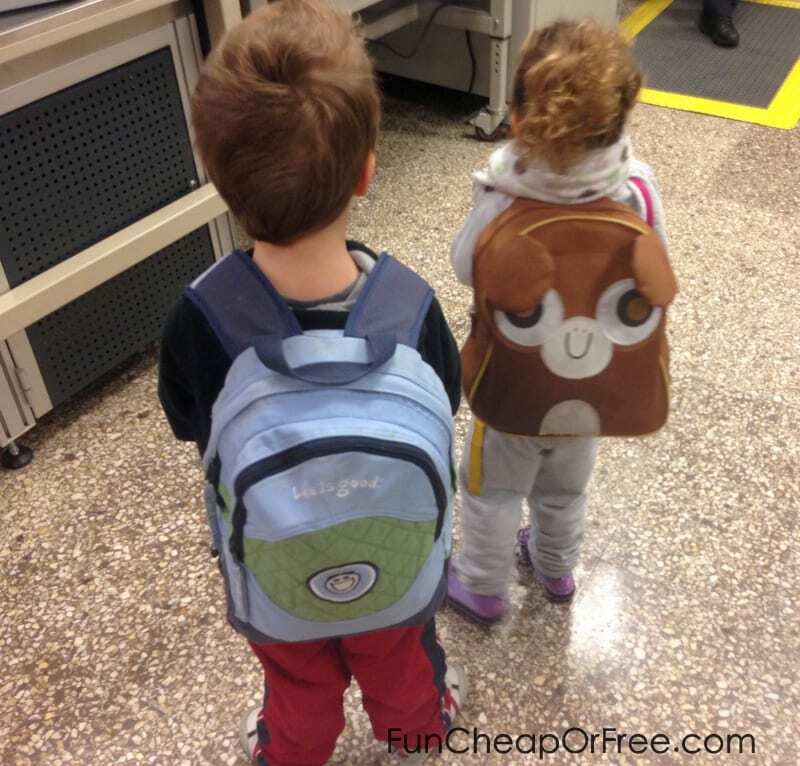 Hide your kids' favorite books and toys at least 2 weeks before your trip. Bust them out when traveling and it will do a much better job of entertaining them! Have an “electronics fast” at least 1 week before you go. No iPads, DS's, TV, nada. If you take it away, it will be all the more special on your trip. And trust me, you'll need all the electronics you can get on your trip. Set out your suitcases early! As explained in THIS POST, I will set out my suitcases one week early. Throughout the week as I do laundry, anything I want to take on the trip goes straight in the suit cases. 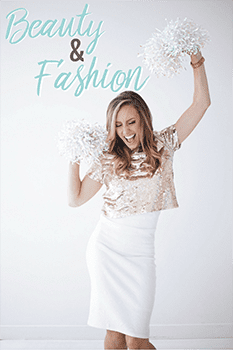 It gives me plenty of time to think through outfits, and allows me to give up on unnecessary laundry at the last minute if I run out of time, knowing I have everything packed that I need and can let the rest go. Pack-n-play or portable crib. They have them on-board. Just make sure the hotels you are staying at before and after the cruise have them. Both of ours did. Car seats. Well, we didn't bring them, anyway. As mentioned above, our shuttle driver had one for us, as do rental car companies many times. Beach towels. On our cruise they let us use ship towels off the boat. My friend told me that on her Bahamas cruise with Princess, they weren't allowed to take cruise ship towels so they had to buy some. 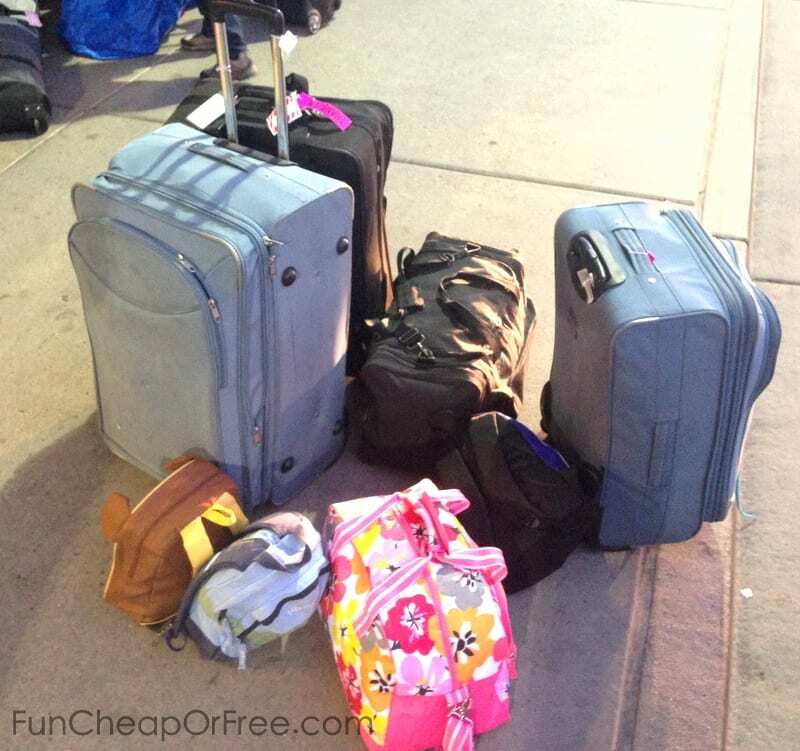 We decided to risk it and not pack them, since they would've taken up an entire suitcase. Aside from your typical packing and necessity, here are some cruising-with-kids-specific things to make sure you bring. Don't have them? Borrow first, buy second (and don't be afraid to buy second-hand)! Pool floaties for non-swimmers. We brought a life jacket for my 4 year old, Puddle Jumper floaties for my 2yr old, and a floatie swim suit for the baby. We got them from Costco or yard sales over time. We packed them in the 3rd large suit case. SUNSCREEN! I like the spray kind. Empty Ziplock baggies of all sizes. Gallon, quart, sandwich, and snack. They come in handy for packing snacks from the ship, keeping your toiletries from leaking, bringing shells home from the beach, etc. We used them multiple times every day! Movies/entertainment that doesn't require wifi. iPad stand This saved us on the plane and at dinner especially. This basic iPad stand was a life saver! Life-proof phone and iPad cases. Guys…trust me on this one. They are worth EVERY PENNY. They are water, shock, and shatter proof. After paying $150 to get my phone screen fixed (for the 2nd time) I decided it was time to bite the bullet and get one. WE LOVE THEM! They work so well, we were able to take under-water photos and videos, without it damaging our electronics. If you have kids, you NEED these cases. They aren't bulky, either! I have the white Nüüd case for my iPhone 5, my husband has black one, and we have the black Nüüd iPad case as well. 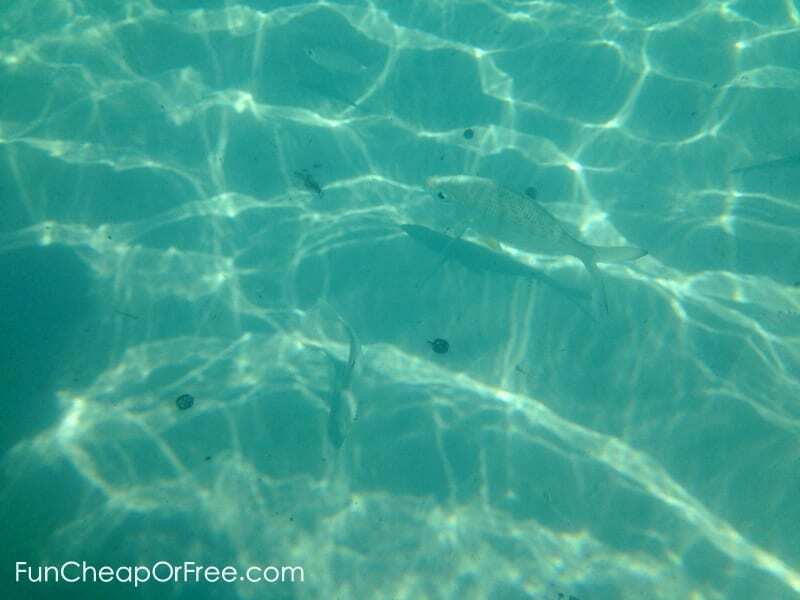 It was really fun going snorkeling with our phones because we could take video and pictures of the fish we saw. Again, if you're going to invest in nice electronics, you should invest in a nice, protective case. I have worked for MONTHS to get a discount on these cases (very rare to find) and was finally able to nab one! Use the code FUNCF10 to get 10% off your order for the next few days. Again, I can't say enough. Though an expensive phone case, I find it has actually saved us money in the long run since I'm so hard on my electronics. ERGO baby carrier . These are THE best carriers, because they don't just work for your baby…they work for your toddler too! We pack ours on every trip. It travels really well because it's completely fabric, so it folds up and can be smushed around in the suitcase without ruining it. It has front, hip, AND back carrying positions, so we could carry even our toddlers on our backs if we needed to. They aren't cheap, is the only problem. I found mine on some deal site forever ago. Look online for a used one, or keep your eyes peeled for a good deal. They are worth every penny! White noise machine. We use them at home, and LOVE them when traveling. THIS MACHINE is the one we use and love. When packing so many little kids in such tight quarters, having a noise buffer keeps us from waking each other up so easily. Get a headphone splitter. Phones and iPads only have one headphone jack. If you don't have a splitter, only one pair of headphones can fit in at a time. We had a splitter so our kids could share the iPad at dinner and on the plane (see next pic). Over-the-head headphones, rather than ear buds. Kids' ears are so tiny, ear buds don't stay in most of the time. I find the over-the-head kind stay on way better, even for our baby. Make sure you bring extras, too. Remember, kids are hard on stuff! While ear buds will sometimes stay in my 4-year old's ears, they are too big for my other kids, so we like the over-the-head headphones best. Snorkel equipment. We bought a nice set for $40 at Costco before we left that included the fins/mask/mouth thingie/carrying case/safety whistle. We packed it in our suit case and were SO HAPPY we did! Renting or buying the equipment once there would've cost us double or triple that. We didn't do any excursions with our kids (too young, too expensive) so having our snorkel equipment let us have fun and really enjoy the beaches without paying for an excursion. Baby food pouches and applesauce pouches . Even though there is food on the boat, we bought several boxes of baby food and applesauce packets from Costco before we left and were SO GLAD we did. They came in handy on the plane, in hotels, restaurants, on the boat, and on beaches. No need for spoons, you can put the cap on unfinished pouches, and you can toss them when you're done. They are worth every penny, just for the convenience. My big kids love the applesauce ones and would eat them for snacks too. Second-hand books for YOU. I prefer not to do my reading on electronics when I'm on vacation. It's so hot and sandy in my beach bag, it usually does more damage than good on my electronics. I prefer paperback books. However, I hate borrowing books from friends or the library because my books get trashed when I take them on vacation! Go to a thrift store or the dollar store and get books from there! When you're done reading it you can give it away or throw it away and not feel bad about the $0.50 or $1 you spent. I brought some parenting books with me. I suggest A House United , Love and Logic (I read the one for toddlers specifically), and Parenting the Strong-Willed Child . Waterproof mascara. That's basically all you'll be wearing the entire trip. 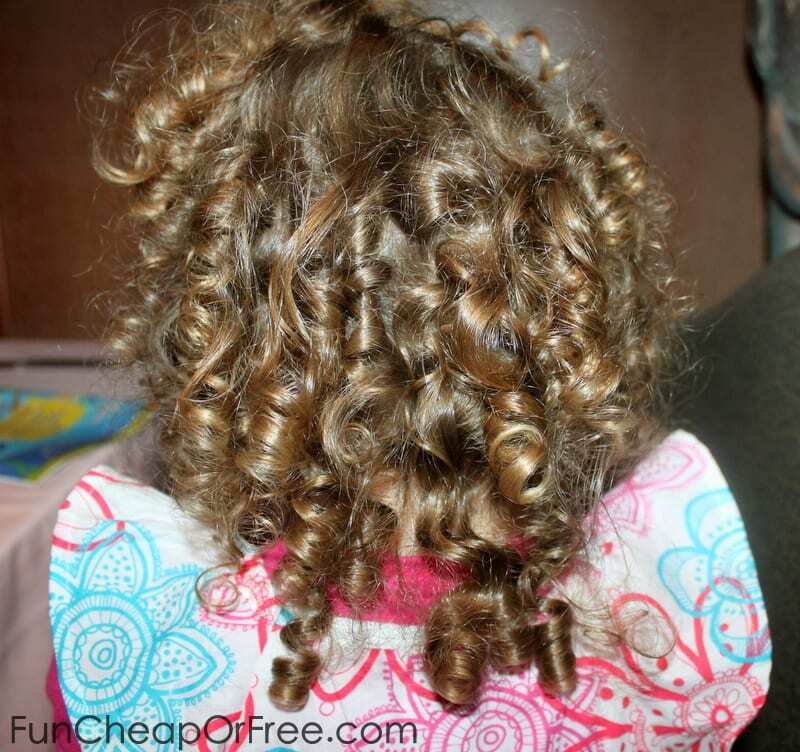 Curl-boost hair product. If you have anything other than stick-straight hair (and even then…) your hair WILL be wavy or curly due to the humidity and salt-sea air. Might as well embrace it and go with it. Priya's hair is pretty curly at home. But on the cruise? No sense in trying to fight it, just embrace it and enjoy the curl! Cheap sunglasses. Don't travel with nice sunglasses, no matter how awesome they look in pics! It's not worth the risk. We had 3 pair of cheap glasses on the trip with us, and only 3 pair made it home. Cold meds. Someone always seems to get sick when we go on vacation. After breathing airplane and cruise ship air for a week, germs are bound to get passed around. It's easy to find adult cold meds, kid meds are harder – so bring some and play it safe. Zarbee's is my favorite medicine, by a billion. It's the only all-natural medicine I've tried that ACTUALLY WORKS (amazingly well, actually). It's a miracle worker. And it's all-natural so I don't feel guilty giving it to my kids! I worked for MONTHS to get a deal and they finally gave me one!! Get $1.50 off any product online using the code ZARBEESSLEEP, and get FREE SHIPPING of any order over $10!!! Hurry and jump on this while you can!! Sleep aid. I don't know about you, but no one in my house sleeps very well on vacation! 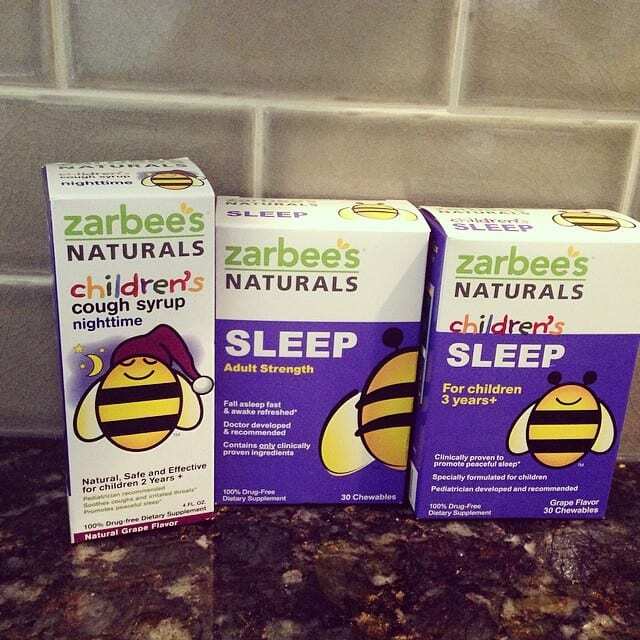 Again, going back to Zarbee's, they have an all-natural sleep aid for adults AND kids. The coupon code above to get $1.50 off for a limited time. Trust me, cramming an entire family into a small ship cabin? You're going to need this, I promise. THESE travel baby products that I can't live without. Seasickness meds. Whether over the counter or prescribed, just get something and PLAY IT SAFE! Take the meds even if you think you aren't prone to seasickness. There is nothing worse than getting seasick. It will ruin your entire trip. Play it safe and put a seasickness patch behind your ear before you even get on-board. On our first cruise together when we were first married, we hit some rough water on the first night and my hubby was sick the rest of the week. Ruined his trip, and we learned a valuable lesson to play it safe. Cases of bottled water and soda. As mentioned above, yes, you can do that! You can't bring your own alcohol on-board (that's where they make all their money, after all), but water and sodas are ok. Sure beats paying $36 for a soda card! Tandem double-stroller. You do NOT want one that's double-wide! It will not fit anywhere! We lived, breathed, and survived because of our stroller. Ours is an expensive Phil & Teds Explorer stroller (they don't even make the explorer any more). It was worth the investment for us because it's a single AND double stroller, it's got jogging all-terrain tires, and is sturdy as heck. We've had it since our oldest was a baby and it will probably last through all our kids. If you don't have a tandem stroller, borrow one. Don't need a double-stroller? Get a tandem double stroller anyway! You can use it to pack your towels, bags, lunches, etc. around when off the ship and through the airports. Our 4 year old walks most of the time. If he gets tired, he will squeeze in next to Priya in the back, or will sit on the plastic part in the front near Beck's feet (above the front wheel). 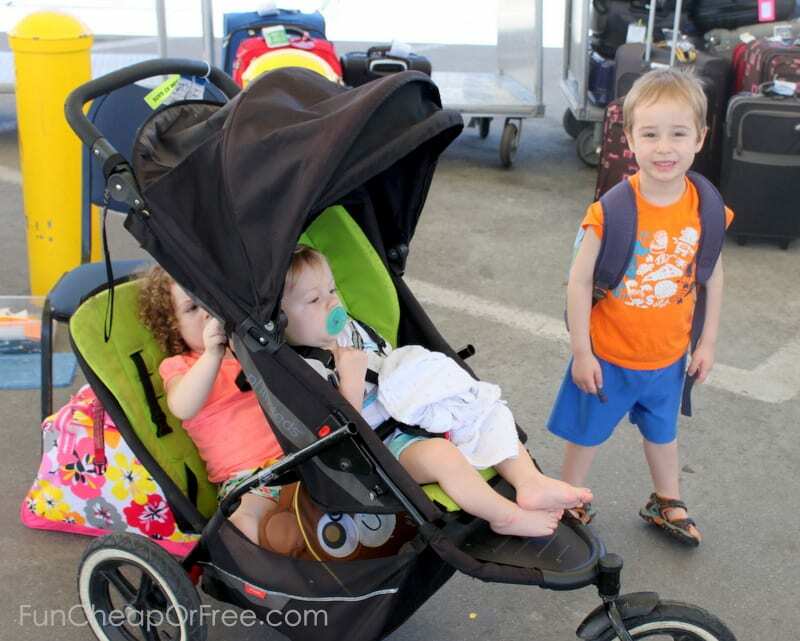 A good tandem double stroller is a MUST HAVE when traveling with kids! Casual, comfortable clothes. Don't try to go too fancy or cute, you'll probably be hot, maybe sunburned, and heck, you're on vacation so enjoy being comfortable! Multiple swim suits. I brought 2 suits per person, and I'm glad I did. They get gross and sandy, and sometimes take forever to dry out. Who wants to put on a damp, sandy swimsuit the next day? Rotating through 2 helped us always have a dry one to put on. Semi-nice outfits for dinner. I did lots of semi-nice dresses with leggings under. My hubby did button-up collared shirts with nice jeans. 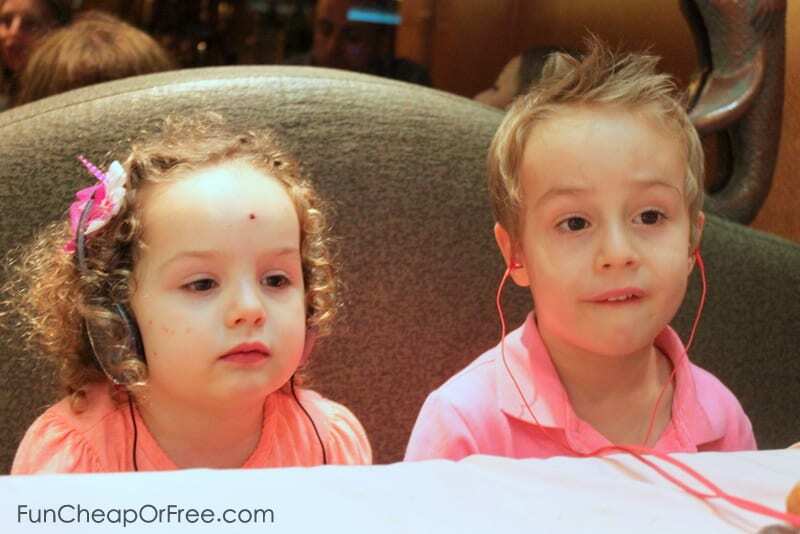 Our kids went very casual at dinner, since they trash their clothes when eating anyway. (See our outfits day-by-day in Part 2). We did dress Priya up in an adorable Sailor dress on the last night at dinner. We had it at home anyway, and it would be a crime to NOT bring the Sailor dress on a cruise?? Really, can you blame us? SAVINGS TIP: When it comes to clothes, don't buy anything! Sometimes people get all excited about going on a cruise and rush to the store to buy all-new things. No! Stay within budget, clothes included. You will look fabulous, even if it's clothes you've had for years. Don't waste your money, use what you have and spend your money wisely elsewhere. For shoes, I recommend 3 pair for each person in your family: Flip flops, comfortable walking shoes, and one pair of dressier shoes for dinner. You aren't allowed to wear flip flops to dinner, but I wore dressier flip-flop wedges that were just fine. This is what we wore to dinner one night. Notice my wedge flip flops. We were all on the nicer-end of casual, which worked out just fine. Don't over-pack! The ship cabins are SO small. We were able to slide our two biggest suit cases under our bed. If we hadn't been able to, it would've been a nightmare space-wise. Don't go crazy, do your best to pack light! Your mail. Be sure to get your mail forwarded or have a neighbor grab your mail for you while you're gone. You will have NO internet or cell access while on your trip. Sure, you can buy it, but it's very expensive and doesn't work very well. Make sure to take care of all your affairs and set a vacation responder on your email before you go. WHEEW! So there's the scoop on everything you need to know BEFORE YOU GO. 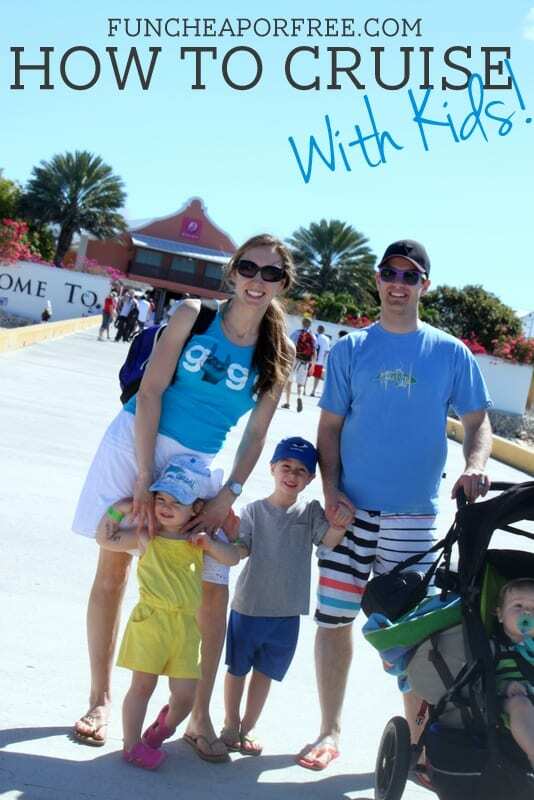 Stay tuned for Part 2 and Part 3 which will give you the rest of the scoop on how to cruise and travel with kids! These are awesome tips! I’ve cruised before but not with my children yet. One more savings tip for books – many ships have libraries that you can borrow books from for free. They often also have a bin with books that other passengers have left on the ship that you can KEEP if you want! I like to bring one or two like you suggested and then trade in that box. That way if I do trash something, it isn’t one they are expecting me to return. That’s a great suggestion! I knew they had libraries, but I never thought about a book exchange. Thanks for sharing! I loved reading this! My hubby and I are planning to go on our first cruise and we also have 3 children, 9, 5, and 21 months. This information was very helpful, one question though is there a dress code listed? I did not know that they had guidelines! I cannot wait to read parts 2 & 3!! Love reading all your tips and tricks! Can’t wait for parts 2 and 3! Thanks for sharing!! We used our credit card cash and flight points, but yes I’ll have to check out those sites!! Aw, makes me want to go on a cruise right now! Great post, definitely pinning it for future reference! Awesome post! Great information, we are in the early planning stages of a few trips, really appreciate all of your tips! 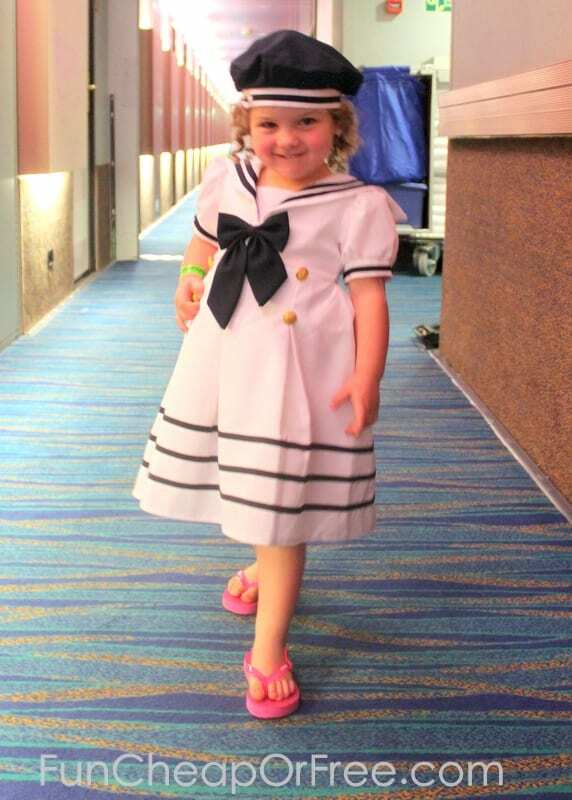 Looks like you had a blast, Priya is adorable in her sailor dress! 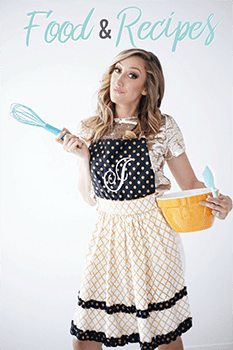 Thanks for sharing Ashley! And honestly, I can’t NOT agree with you…she was a little Shirley Temple in that dress. Thanks! YOU ARE KIDDING ME!!! What a small world!!! haha! Did you enjoy it? Is there anything else you would add to the post advice-wise? I’m not sure what it would’ve been like traveling without kids, and am sure I missed a few things…so let me know what you would add! WOW, you ROCK!! Can’t thank you enough for all of the info (can’t wait for Parts 2 and 3!!) I’m planning a cruise for my boyfriend and me, and then one with the kids. I am a HUGE planner/website scanner/coupon finder, so I would have driven myself crazy trying to find the “best price”!! Just the tidbit about “same price everywhere” has saved me countless HOURS of searching and my sanity (no….seriously!) Also love the “limit the days at sea” tip! Thanks again, great info and very appreciated!! Whom exactly did you call to get the shuttle van to bring a car seat? We are not bringing car seats but will be taking shuttles and I would like the car seats if they are free. How far in advance do I have to call? Before I leave? when my plane lands? Also, did you have to request a crib in advance for your cruise room? Thank you so much! I’m so excited to read parts 2 & 3 as I prepare for our cruise! I’m a little worried about taking our 2 small kids, but excited too! Great questions! Wait for parts 2 and 3, they will probably answer all your questions. If not, email me and I’ll answer them all for you!! I would also love to see the reply to the commenters questions. I read all three posts & did not see this particular questions addressed in detail. THANKS! Sometimes I’m not notified of comments made on old posts. I’ll go back and reply, thanks for the heads-up! As for the cruise price itself, you’re right, sometimes there are fantastic last minute deals, however, most of the time the best price can be obtained by booking many, many months in advance. I have clients that are already booked for 2015 cruises! The reason for this is that the prices are lowest when the demand is lowest. What’s even better is your travel agent can keep an eye on the prices and is able to reduce the price of your cruise if the price does go down before your final payment. So, you pay a low deposit (usually around $200 per cabin) upfront and then the balance isn’t due until around 2 months before your cruise. If the price goes down before then, you can get the better price, but you can also go ahead and get your airline tickets when they’re at their lowest price as well. And don’t worry….if something happens you can get your deposit back up until a certain point (usually about 2-3 months prior to sailing). And finally, I feel compelled to give my standard speech about passports. You’re right, you’re not REQUIRED to have a passport for “closed-loop” cruises. That is, cruises that depart from and return to the same port in the USA. HOWEVER, if something should happen while you’re in another country (say, for instance, you miss the ship or you get ill and need to be flown home) you would be in big trouble without a passport. You would need to go to the US Embassy in that country and apply for a passport from there before you could return to the US. I always advise my clients to get a passport. They’re about $150 and they’re good for 10 years (kids for 5 years). To me, it’s worth $15 a year for the peace of mind. Beth! This is the best comment ever! Thanks so much for sharing, such great info!!! I just updated my post to include the fact that booking your cruise far in advance is a great way to get a good deal, I had totally forgotten to include that! DUH! Thanks so much!!! Sounds like an amazing trip! I have never cruised with my kids, they are older than yours. Disney had a 20% off special for Canadians on certain Bahamas cruises in January and February this year but the dates just didn’t work for us. My favourite tip was packing spray sunscreen – soooo much easier than lotion for kids of any age! I also love the idea of getting your suitcase ready one week early – I will definitely do that next time! I’m glad you liked it, thanks for reading! And yes, seriously, whoever invented the spray sunscreen is my HERO. Great article! I am yet to take my 18 month old on a cruise but my hubby and I are looking forward to doing so soon! Just as a note, 3 years ago (2011), about 30 members of our family went with my husband and I on our wedding cruise and my two sisters had their infants (and older children too) with them. The cruise ran out of cribs/pack and plays and for the first 2 nights the 9 month old babies had to sleep on pallets on the floor!! The cruise line ended up having pack and playing waiting at one of the ports but the stress that it put on my two sisters took away from the fun week that we had all planned. My advice is to make sure that the cruise itself (not just your travel agency) knows that you need a crib or if you are with in driving distance, bring your own pack and play to be safe. My sisters were both compensated with vouchers but it still put a damper on things. Wow that’s great advice, thanks so much for sharing! We downloaded several movies BEFORE going, as well as some fun apps that don’t require wifi. We didn’t have wifi access either and it worked out just fine! Good luck and have fun! We just took a Disney cruise in November. It was our first cruise and my children’s first Disney experience. It was amazing. Their kids club – free for children ages 3 and up was so great that my children (girl 9, boy 8) begged to be taken to it. We had a late dinner seating and the counselors came to the dining rooms to pick up kids to take them back to the club halfway through the meal. It was magical in ways only Disney can be magical, but still had many of the same points you mentioned here about your cruise. The kids club area is even available on Disney’s island- and it was our favorite port of call. Sodas, tea, coffe, and (tap) water were free all day as well as all the other food choices. My husband and I had as much fun as the kids did. I found your tips in this series to be wonderful- some I had already heard, some I had not. I think with any trip as expensive as a week long vacation can be, research is most important, and I love reading personal accounts like yours to help me plan and decide. I think if it was just us adults we would look at other lines for cruising based on cost effectiveness, but with the kids we will continue to do Disney for a while. OH MY GOSH thanks for sharing! 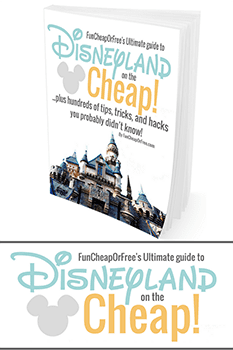 Disney is our next goal cruise-wise so I’ll be reading and re-reading this many times! I’ve done that exact same cruise – minus the little folks. It was wonderful. I’m from Utah too and next week, I am off on a Western Caribbean cruise with the Six Sisters. I’m feeling very brave because I’m going all by myself and I don’t know a soul other than the sisters, but I’m sure by the end, I will have had a marvelous time! You’ve got some very good tips here. We’ve been on Carnival Victory, too! We’ve cruised other “nicer” cruise lines, but I was so pleasantly surprised with the Victory. 2 years later and we still talk about how much we loved Half Moon Cay! Ahhh…. 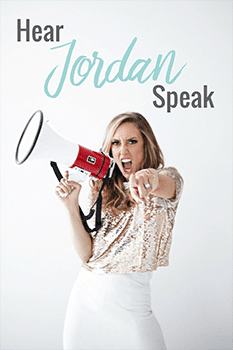 I loved your blog! My Dream is to take my Kids and Grandkids on a Disney a Cruise in 2017! Thanks for sharing. We are going on a cruise in 6weeks with our 4 kids, ages 10,10,10 and 12. One of my kiddos has special needs , including food. Did you have any problems getting food for your little one? Jack only eats puréed food, and the thought of bringing a weeks worth of food is overwhelming! Thanks for all of the great tips! I will definitely share with my family who is also coming! thanks for all the great information very informative. I read everything! Please remind your readers that children who are not thoroughly toilet-trained are never allowed in cruise ship pools or hot tubs, including the “family” pools and hot tubs. No diapers, including “swim” diapers, are allowed in cruise ship pools or hot tubs. This is because they are cleaned and filtered differently than those on land, and there are lots of regulations concerning discharging water from them into the ocean. These rules are created and enforced by the CDC and you will find them on all the cruise ship websites. I’m sure the floating swimsuit and arm floaties were used in the ocean, but they shouldn’t have been used on board unless the children are thoroughly toilet-trained and out of diapers. These rules are posted by the pools. I wanted to add that a few cruise lines each have a few ships (more all the time) with what they all “splash zones” for infants and kids who aren’t toilet trained. They are simple areas with spraying spigots and little if any standing water. I wish I could name the lines/ships here but it won’t be hard to find that information online for those who need it. The problems really come when one parent is trying to supervise two or more children, one of whom is trained and old enough to get in the family/kid pool and another who must be limited to the splash zone. Often they are not in eyesight of each other. The kids who are toilet-trained aren’t allowed in the splash zone. So that can be difficult if only one parent is supervising the water play. Great article!, but sadly the prepaid gratuities are a drop in the bucket to what actually gets to the people who service your room and serve dinner! It’s important to tip your steward, your waiter each night, and any room service deliveries! I realize this is an old post, but feel I must add something very important. Babies and kids in diapers of any kind, including “swim” diapers, and those too young to be toilet-trained, are not allowed in cruise ship pools and hot tubs, not even “family” or “kid” pools and hot tubs. This is a regulation from the CDC. It can be very hard to supervise older kids while keeping the baby/toddler out of the pool. This post is GOLD. My favorite tips (that I never would have thought of by myself) were hiding favorite books and toys, the electronics fast, and embracing the curly hair. I’m going to look for a product for that the next time I go to the store so I can practice up a little. Thanks so much for sharing your experiences! Thank you very much for this well informed article. I have never been on a cruise before so this will be the first for me and my little ones, 5 and 2. This article has calmed my fears and answered my questions. This year we stayed at the Barcelo a bavaro in Punta Cana and it was quite a bit. So cruising seemed cheaper. I will update and share this awesome information. So many great tips in here. You didn’t leave anything out, thanks!! We are going on a cruise next week to the Caribbean with our 1 year old. 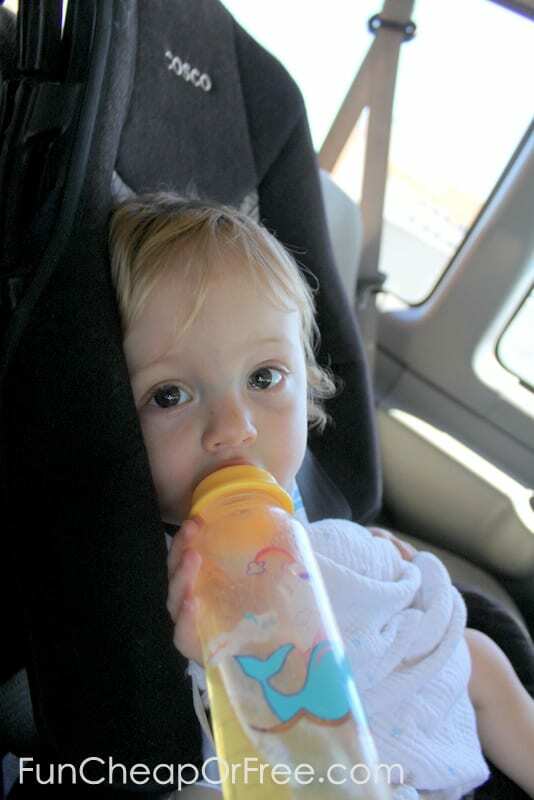 What would you bring for the 1 year old for motion sickness?